V&A Jewellery - Amethyst Gem Drop Earrings: Inspired by an enamelled gold pendant set with and amethysts and pearls, designed by Pasquale Novissimo for Carlo Giuliano, England (London), about 1880. 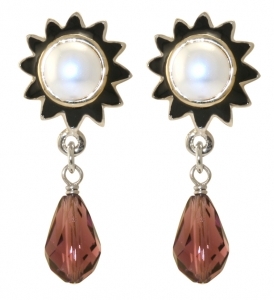 These earrings are gold-plated and hand enamelled with faux pearl. This piece is inspired from an object in The Victoria and Albert Museum, London. V&A Jewellery - Giuliano Floral Pendant: Inspired by a pair of earrings presented to the V&A Museum by Carlo and Arthur Giuliano, the sons of the maker. V&A Jewellery - Large Amethyst Gem Pendant: Inspired by an enamelled gold pendant set with and amethysts and pearls, designed by Pasquale Novissimo for Carlo Giuliano, England (London), about 1880. V&A Jewellery - Gold Rosette Pendant: Inspired by a pair of solitair studs made in gold, in the form of stylised flowers, the centres and alternating granulated petals and filigree ornament. V&A Jewellery - Golden Sun Pendant: Inspired by a stud of a Sun design made by Carlo Giuliano in London between 1865-1870. V&A Jewellery - Giuliano Floral Bracelet: Inspired by a pair of earrings presented to the V&A Museum by Carlo and Arthur Giuliano, the sons of the maker. V&A Jewellery - Giuliano Floral Earrings: Inspired by a pair of earrings presented to the V&A Museum by Carlo and Arthur Giuliano, the sons of the maker. V&A Jewellery - floarl pearl Enamel Chandelier Earrings: Inspired by a pair of enamelled gold earrings hung with pearls made in 1890 by Carol Giuliano. V&A Jewellery - Giuliano Enamelled Cross: Inspired by a cross of gold with cloisonné enamel, made by Carlo Giuliano, England (London), 1874-1895. V&A Jewellery - Gold Rosette Earrings: Inspired by a pair of solitair studs made in gold, in the form of stylised flowers, the centres and alternating granulated petals and filigree ornament. V&A Jewellery - Floral Pearl Enamel Pendant - Inspired by a pair of enamelled gold earrings hung with pearls made in 1890 by Carol Giuliano. V&A Jewellery - Giuliano Sunflower Cufflinks: Inspired by a pair of Sunflower design earrings made by Carlo Giuliano in London between 1865-1870. V&A Jewellery - Pink garland range - taken from a beautiful French jewelled bow pendant dating from 1760, this extensive range comes in pink and clear stones with Swarovski crystals. V&A Jewellery: 18th century bodice bracelets and pendants - influenced by a bodice ornament or stomacher containing rose-cut pastes, dating from around 1720, probably English, this jewelled bracelet is silver-plated.